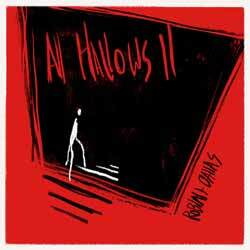 Long-time collaborating retro musicians and recording artists Robin Ogden (known as OGRE) and Dallas Campbell release the fictitious horror movie soundtrack All Hallows’ II, available for download and on cassette. The premise is that 35 years ago, police discovered the remains of over a dozen former patients in the sub-basement of an alternative healthcare facility, The Shephard Institute For Psionic Inquiry. All Hallows’ II is the story of investigative journalist Ellis Ledstone and Shephard’s other victims, whose bodies were never found. Using the case files from the events of 1983, it is the listener’s task to assess all of the evidence and uncover what really happened at the institute. There are logged interviews, reports and artefacts which are included digitally with the release, and physically with hard prints with the soundtrack. Loving mysteries and being a life-time horror enthusiast, I found this concept more than intriguing. Furthermore, the invocation of the weird fiction of H.P. Lovecraft (one of my favourite authors of all time) and the film music of John Carpenter (my favourite film director bar none – I have all of his soundtracks, too) this really had been built-up to the point of high expectation. This is always a danger; using classic names invariably leads to a disappointing let-down. However, these guys have a passion for what they do, which is exemplified by the fact they live 3,594 miles apart and have never met in person – collaborating only on-line using FaceTime, Dropbox and Sid Meier’s Civilisation V. All Hallows’ II is their fourth collaboration, their last score being a reimagining of George A. Romero’s Night of the Living Dead. They have a common fondness for analogue, tape machines and vintage synths. But how does the duo’s latest offering shape-up? There are 24 tracks offered-up, many of them brief linking sections featuring mood pieces or sampled sounds, but even these include some nice surprising little melodies which I wish had lasted a little longer. The entire myth score is tributes and influences from the classic synthesiser soundtracks of the 1980s, like Tangerine Dream and bands such as Goblin and Kraftwerk. So we have 'Ident VI', which is a short Close Encounters of the Third Kind-like introduction. 'Admittance', and 'Have You Seen Me' are straight out of the John Carpenter book – the latter with added curious drum beat changes. 'The Couvert Tapes' goes one step further by emulating Carpenter’s Prince of Darkness with a back beat. 'Last Days of Daylight' is reminiscent of many neon glitzy horror films of the late 1980s. I realise this is supposed to be a fictitious horror movie soundtrack, but I would have preferred to have had this seemingly bottomless box of electronic sounds and music patched together into longer pieces of music. In fact, many of these segments deserve an extended stay. Six or eight tracks only would have meant many of these melodies and samples could have been incorporated into one more coherent (and cohesive) piece. '911', 'The Gate is Open', and particularly 'Details Unknown' could have shone more brightly. 'Satanic Panic' promises much, but isn’t a strong piece to end the album with. Much of this type of music hasn’t been enjoyed since the New Romantics era. For that reason it’s priceless, but I also can’t help feeling it is a missed opportunity. Look out for a selection of B-Sides and cuts entitled: All Hallows’ II: Coda, which will follow this release.